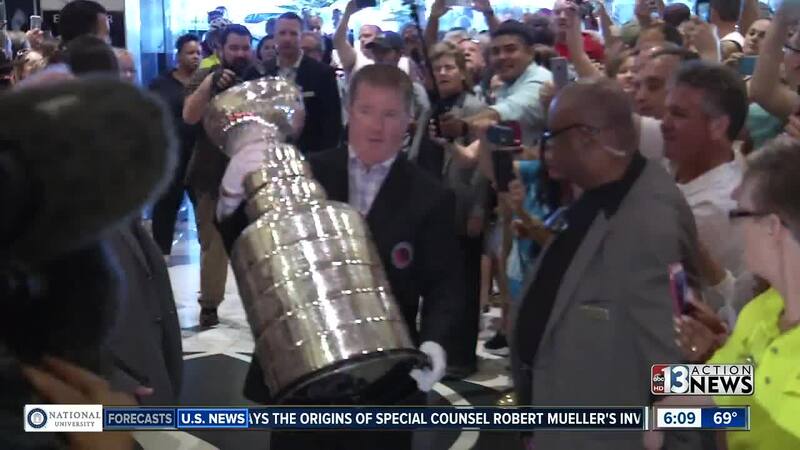 The Stanley Cup is one of many NHL trophies on display at the Hard Rock hotel-casino today and tomorrow. UPDATE JUNE 21: Vegas Golden Knights Head Coach Gerard Gallant received the Jack Adams Award for most outstanding head coach at the NHL Awards Wednesday. Gallant received 102 first-place votes among the 108 ballots cast. The team's general manager George McPhee received the NHL General Manager of the Year Award. He received 25 first-place votes among the 39 ballots. Players William Karlsson received the Lady Byng Memorial Trophy for skill and sportsmanship while Deryk Engelland received the Mark Messier NHL Leadership Award. The Stanley Cup may have evaded the Vegas Golden Knights this season, but that doesn't mean that it won't make a trip to Las Vegas. The Stanley Cup is one of many NHL trophies on display at the Hard Rock hotel-casino today and tomorrow. The display is part of the 2018 NHL Awards that are taking place at 5 p.m. on June 20. Golden Knights Head Coach Gerard Gallant is one of two VGK representatives up for awards on June 20. Gallant will take on Colorado Avalanche coach Jared Bednar and Boston Bruins coach Bruce Cassidy for Coach of the Year honors. You can see the Stanley Cup up close and personal today from noon to 2 p.m. and 6 p.m. to 8 p.m.